A catching or locking of the digits is called trigger finger. This condition is extremely common and occurs in conjunction with other hand maladies including carpal tunnel and tennis elbow. Locking of the thumb is similarly named trigger thumb. Once a single digit is involved, the likelihood of additional digits suffering from the malady increases. The tendons which bend our fingers and thumb run through a rigid sheath. The sheath is reinforced in areas and hand surgeon call these areas pulleys. The pulleys function like eyelets on a fishing rod. 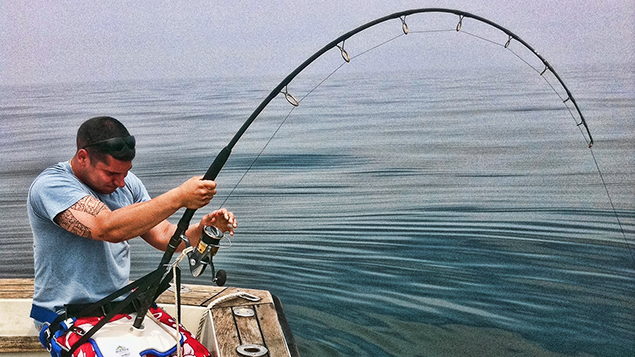 The eyelets on a fishing rod improve the efficiency when you reel in a big fish with the rod bent. 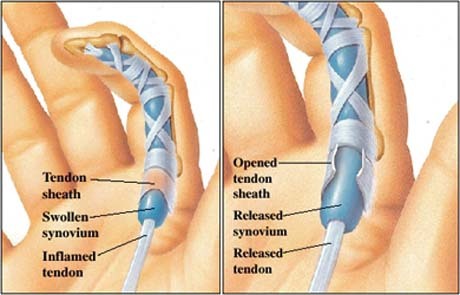 Similarly, the pulleys in the flexor sheath improve the mechanical efficiency for the finger bending system that starts with the muscles in the forearm. The flexor sheath of the finger viewed from the side. The main pulleys are numbered A1-A5 and prevent the tendon from bowstringing with flexion of the digit. If in the fishing rod story, the eyelets are not present—when the rod is bent, the fishing line would bowstring. This would cause the fisherman to need to reel more—decreasing the mechanical efficiency of the rod and reel. A fisherman reeling in a big catch—note the eyelets of the rod prevent the fishing line from bowstringing. However, not all eyelets are of equal importance either in the fishing rod or in your finger. If you broke the eyelet closest to the rod—there would be minimal disruption in the rods ability to work. Similarly in the hand, the eyelet number A1 which is closest to the forearm is least important. In trigger finger, swelling occurs of the flexor tenosynovium and the tendon catches or locks as it attempts to go under the A1 pulley. In mild conditions there may be only a click, as the disease progresses—the finger may lock completely usually in the flexed position. A side view of the finger—the swelling or nodule makes it difficult for the tendon to pass through the A1 pulley—resulting in clicking, catching or locking. Patients typically report catching or locking of the digit with bending. These symptoms are typically worse in the morning. As the disease progresses, there may be increased pain associated with the digit. The ring finger and thumb are most often involved, but any digit may be effected. After determining your symptoms and detailing a history of your difficulties, a physical examination will be performed. Your hand surgeon will note the range of motion of your extremity. Further notice will be focused on the function of the nerves in the extremity. The surgeon will note any tenderness over the A1 pulley of the digit. The surgeon will ask you to place the digit through a range of motion to detect any clicking, catching or locking. Since x-rays routinely have not been found to be helpful in the condition, unless other entities are suspected they typically are not ordered for this condition. Non-surgical treatment is typically indicated early I the disease or if the triggering symptoms are mild. Nonoperative treatment is typically more effective in these situations. Activity modifications may be helpful if the patient has vibratory exposure or repetitive hand gripping. Patients with more severe symptoms may be candidates for a steroid injection into the flexor sheath. Steroids are powerful anti- inflammatory agents and thought to decrease swelling of the synovium. Interestingly, oral anti-inflammatory agents are not thought to be effective for the disease. If symptoms are controlled by these measures, no further treatment is indicated. 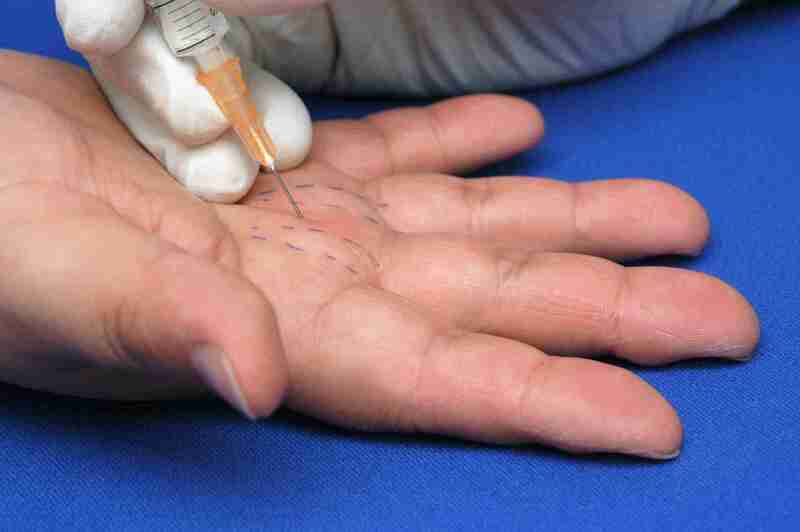 Overall, approximately 50% of digits injected will respond to steroid injection alone. Patients who have recurrence after the first injection have poorer response to subsequent injections. Finally, patients with multiple digits affected are less likely to gain resolution in all digits with injections. If the patient’s symptoms persist, despite nonoperative management, surgical treatment is the next logical step—called a trigger finger release. All surgical management is centered on decreasing pressure on the A1 pulley. Typically the A1 pulley is divided and no further treatment is necessary. Surgical treatment can be performed as an outpatient surgery, typically using local anesthesia. A small incision is made in the palm of the hand and the A1 pulley is divided relieving the catching of the flexor tendon in this location. In the image on the left the swollen tenosynovium prevents the tendon from gliding underneath the A1 pulley. In the right image, trigger finger release divides the A1 pulley allowing gliding of the tendon and elimination of triggering. After surgery, a light wrap will be applied to your hand. In most cases, a dressing change at home 4 days after surgery is used and band aids are used to keep the incision clean and dry. The patient may begin using the fingers and thumb after surgery for light activity and increase activity as tolerated. Sutures are removed in about 2 weeks and continuation of grip strengthening is emphasized. The catching and locking of the digit is typically cured immediately with the surgery. Pain and discomfort decrease over time after surgery and most patients describe it as soreness. Hand therapy is typically not required after trigger finger release. Standard surgical risks for surgery are applicable including infection, bleeding, and anesthetic risks. Most cases do not require prophylaxis for deep vein thrombosis.